Floor Area: 1,196 sq. ft. Floor Area: 1,085 sq. 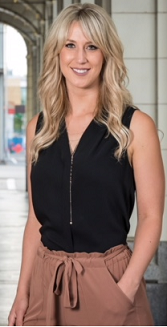 ft.
Born and raised in Calgary, Samantha is a second generation Real Estate Agent. Her successful father has been in the business for many years, which is how Samantha started to develop her passion. This gave her the opportunity to live and experience the industry at an early age. There has always been an obvious interest taken into this career path, now she’s finally pursuing her dream job as a real estate agent. Starting in the summer of 2013 Samantha took her first step into the industry and became an assistant for an extremely successful team. She worked for three realtors keeping them organized and prepared for all their appointments. Always thriving on her hard work and dedication Samantha tried her best to provide all the buyers and sellers with a positive experience for over the two years she was there. Making herself available at all times she will go above and beyond for all her clients. With a client first attitude she builds strong relationships and maintains them even after a transaction closes. Communication, empathy, and honesty is key in this business; Samantha prides herself on that. Your happiness is her success!